Description:Since 2008, the business leaders in the Lower Manhattan communities of Chinatown and Little Italy - The Chinatown Partnership and the Little Italy Merchants Association (LIMA) - have joined forces during the Christmas season in the spirit of peace and good will to celebrate the holidays by co-producing and presenting a colorful parade, aptly called The East Meets West Christmas Parade, that proceeds through the main streets of both communities on the Saturday afternoon before Christmas Day. 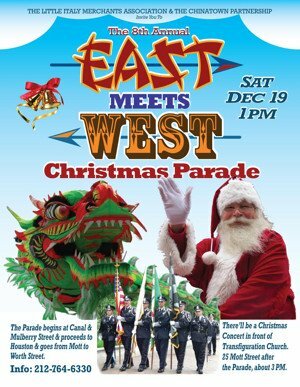 This year, The 8th Annual East Meets West Parade will take place on Saturday, December 19, 2015, at 1:00 PM, followed by a holiday Chinese musical performance on Mott Street in Chinatown. The Parade will form at the corner of Canal and Mulberry Street at 12 Noon. There will be two Parade floats - one with Santa Claus and children, and a second float with musical performers, including dancers and singers. The Parade lineup will include; a color guard from Chinatown's American Legion Kimlau Post 1291, which will be at the front of the procession; two or three marching bands from Chinatown and Little Italy, including the Red Mike Italian Festival Band, a mainstay at festivals in Little Italy since 1927; a delegation of marchers from the Order Sons of Italy in America (OSIA) Lt. Joseph Petrosino Lodge #285 in Little Italy; Lion and Dragon dancers; members of local associations, union locals, community groups from Chinatown and Little Italy; and celebrities and VIPS, etc. There will be a Photo Op staged before the start of the Parade at 12:30 PM, featuring local, state and federal elected officials; local community leaders, and celebrity VIPs. Please click on a star rating for East Meets West Christmas Parade. Please type your review for East Meets West Christmas Parade.